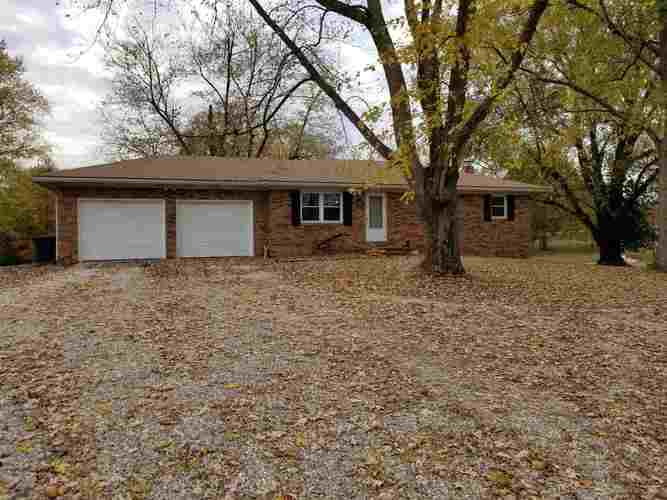 Located on Evansville's desirable west side, this home is ready for you to move right into! Located on 3.3 beautiful acres, the possibilities are endless! This full brick ranch has a complete walk out basement! New floors upstairs include beautiful wood laminate floating floors in the living room and halls. New triple pane windows will help keep winter winds to a minimum and help keep utility bills low. The guest bathroom has been completely updated with a new tub, tub surround, toilet, faucet, vanity, mirror, light, floors. New carpet is included in every bedroom - along with new paint, lights, doors. The master bedroom has been completed with new carpet, ceiling fan and the master 1/2 bath has a new toilet, vanity, mirror, light, floor. The eat in kitchen has plenty of prep space with the breakfast bar! Kitchen appliances are included and include the new extra tall stainless refrigerator, stainless stove and new range hood! Other updates include per owner: kitchen cabinets painted, new sink, faucet, counter refinished, New water heater, new furnace, roof - 2010, new garage doors, septic serviced 2018, new doors throughout. Seller in including a 1 yr home warranty!